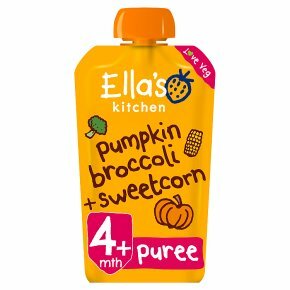 Hello, I'm organic pumpkin, broccoli + sweetcorn steamed in water to make me just the right texture for little ones starting their weaning journey. I'm organic. Perfect purees. Love veg. Super smooth. Just yummy organic food for babies. No lumps or bits and nothing artificial. I'm gluten free. No added salt. No added sugar - I contain naturally occurring sugar.Who am I for? My ingredients are suitable from 4 months and my vegetable tastes will help little ones learn to love veg throughout weaning and beyond! The Government advises that you don't need to wean your little one until they are 6 months. Every baby is different!